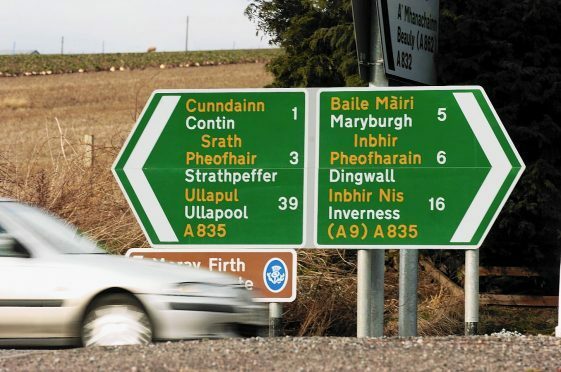 Just two complaints have ever been made to the Scottish Government about Gaelic road signs, it has emerged. Bilingual signs have proved controversial for some in recent years amid concerns over their cost and alleged road safety impact. But a freedom of information (FOI) request response has now revealed that since 2002, just two complaints have been made about such signs to the Scottish Government and Transport Scotland, which runs the trunk road network. It follows a previous disclosure that only £3,510 had been spent by Transport Scotland on Gaelic road signs and safety material between 2014 and 2017, although a total of £2 million had been spent generally on trunk road signs in the Highlands between 2002 and 2010. Skye, Lochaber and Badenoch MSP Kate Forbes said: “These figures prove that most people have better things to do than complain about Gaelic road signs. “It costs very little, largely because Gaelic names are added when the signs need replaced anyway, it enriches our culture and it’s perfectly safe. “It is pretty obvious, but the Gaelic names are more often than not the original names. The SNP MSP added: “For years, Gaelic speakers have been forced to speak English, work in English and use anglicised versions of the very places they call home. In response to an FOI request on the issue, the Scottish Government said: “In 2002, Transport Scotland, in consultation with The Highland Council and Argyll and Bute Council, established a rationale for introducing bilingual road signs on trunk roads that pass through these regions and which lead to west coast ferry ports. “As a result, bilingual direction signing has been provided on the A82 trunk road from Tarbet to Inverness and those trunk roads leading to the ports at Kennacraig, Oban, Mallaig, Uig and Ullapool. “This policy, which is consistent with the aims and objectives of the Gaelic Language Plan is also being extended to include the A9 north of Perth as part of the A9 dualling programme.